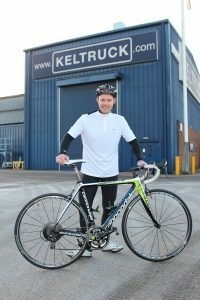 On Saturday 22 June 2013 Paul Green, Group Warranty Manager for Keltruck Ltd., will undertake an impressive 220-mile charity cycle ride starting at Keltruck’s Cross Hands Branch in South Wales and finishing at Keltruck Worksop in Nottinghamshire. The route takes Paul and the other riders from their start on Saturday 22 June in South Wales over the Brecon Beacons, through Hereford and Worcester and into Droitwich to finish off day one. Day two (Sunday 23 June) starts in Droitwich heading north through Bromsgrove, West Bromwich, Burton, Derby and onto their final destination of Worksop. Anyone who wishes to make a donation to this charity can do so by visiting justgiving.com/Paul-Green12. Paul, 43, has worked at Keltruck for 26 years commencing as a YTS apprentice in 1986 at the West Bromwich branch. Having passed his City & Guilds levels 1, 2 & 3 he continued to work as a technician until 1996 when he was offered the position of service advisor at West Bromwich depot which he undertook. In 1997 Paul was promoted to manage the Esso & KwikSave VMUs before moving onto Droitwich in 1998 as Branch Manager. In 2000 Paul was offered the role of Group Warranty Manager which he accepted and still performs today. If you would like to contribute to this truly special event please visit www.whenyouwishuponastar.org.uk and justgiving.com/Paul-Green12 to show your support for Tour De Branch.